The Word of the Lord Endures Forever Journal. A free journal with orders of $49 or more! *Qualifying orders include sales of select in-stock CPH items identified by the free gift offer icon only and exclude special-order items (drop-ship or print-on-demand), gift cards or gift certificates, prepublications, technology subscriptions, technology support, other subscription or perpetual purchases, and Lutherans For Life (LFL), Lutheran Women's Missionary League (LWML), Bethesda, and Synod products. This offer is valid for new orders placed through cph.org or phone only. This offer is not available for sales of products purchased for resale. Minimum order of $49 USD. U.S. and Canada only. Standard UPS ground and commercial shipping only. Some exclusions may apply. Offer valid through May 31, 2019. Lutheran Service Book: Pew Edition is a hymnal with a rich compilation of Christ-centered services, psalms, hymns, and prayers to nourish the faithful week after week for generations to come. Beautifully designed cream white paper reduces glare and increases legibility. Classic burgundy leather-like edition. Lutheran Service Book: Pew Edition contains a mixture of full harmonizations and melody-only hymns. For accompaniment settings of all hymns, see Lutheran Service Book: Hymn Accompaniment Edition. Don't forget ribbons! 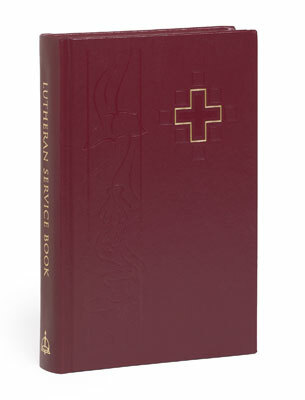 Lutheran Service Book: Pew Edition does not include ribbons; add an LSB Ribbon Bookmark to your pew edition. Do you need bookplates? Add LSB Adhesive Bookplates to signify that specific hymnals were given to the glory of God in recognition of a special person or occasion. Large print and braille editions of the pew edition are available from Lutheran Braille Workers. Contact them at http://www.lbwinc.org or 1-800-925-6092. Click here to learn more about Lutheran Service Book. Although some of the favorite hymns are missing, many more confessional hymns are added. This is a great replacement for TLH (won't even mention LW). This liturgies are well thought out. The organization of the hymnal is very easy to use. I highly recommend it! Be sure to read the fine print. You have to order ribbons separately, as the hymnal is pictured with them, but does not include them! Not happy with my order, and the response from the customer service agent. I will NEVER order from CPH ever again! I like to give these to our confirmands so that they can take the hymns and devotional material home and make it their own. I appreciate the Biblical references through out. Excellent hymnal. Christ-centered. Cross-focused. Easy to learn and use. Retains many older, familiar elements; but introduces some fantastic new hymns. In my personal opinion, its the best hymnal in Lutheranism today. This hymnal represents a work NOT Scripturally mandated, and a great disgrace foisted on LCMS by the convention voting body. Despite the fact that over 500 of the hymns from TLH are old and familiar, no heed was given to that fact. Rather than building on its magnificent predecessor, the TLH, the convention summarily judged and executed it by rearranging & re-numbering the original 660 hymns, eliminating many of them, and diluting them with a deluge of new and even doctrinally questionable hymns. The result-a quagmire of over one thousand hymns that likely cannot become familiar even in two lifetimes. I have bought 2 of these books so far for my 2 older children for Confirmation and I plan on buying another for my last child for Confirmation. It's a very good book :) Highly recommended! !